When I review the statistics on my blog, one of the most popular ones is Exporting tasks into Outlook – http://www.applepark.co.uk/exporting-tasks-from-project-into-your-outlook-calendar/. I’m not sure how many people have implemented the solution outlined, but I suspect those that have implemented it have done so on a personal basis. When it comes to enterprise solutions, (i.e. those that can be managed and maintained centrally for hundreds or thousands of users) both Project Server 2010 and Project Server 2013 have capabilities in these areas, but are constrained by demanding specific security permissions in the Exchange environment, as well as only working with specific versions of Exchange. In order to free myself (and hence customers) from these specific constraints imposed by Microsoft, I’ve recently been getting up to speed and involved with a 3rd party product that provides a richer synchronisation experience with Project Server. The product is called Allocatus and is written by a German company called holert.com. Renke, who owns the company, has been implementing Project and Project Server systems since 1997, is a published author (having written books for the German market on every version of Project since 2003) and has grown the company into one of the leading Microsoft Gold Partner Project Server consultancies in Germany, with offices in Munich, Berlin and Oldenburg. The requirement to synchronise Outlook and Project Server calendars has been around for many years (remember the Outlook add-in for Project Server 2007), but the requirements differ whether you are a user, the PMO (or business) or IT. From a business requirement, there may be additional reasons why the business wants users to update information regarding Project Tasks, and this is typically when an organisation manages a remote service or maintenance team, and the members of the team need to be scheduled to make a site visits. Rather than phoning in or relying on email, the organisation can simply utilise Project to plan the resources’ time commitments, and the tasks are synchronised to the service team’s mobile phones. Additionally, the resources can update the task directly on their phones, thereby updating the Project plan. Exchange (from 2003 onwards), with any version of Project Server (from 2002 onwards) to any version of Outlook (from 2000 onwards). Domino server, with any version of Project Server (from 2002 onwards) to Notes. Any version of Project Server (from 2002 onwards) directly to any version of Outlook (from 2003 onwards) – this scenario removes the requirement to use Exchange. Any version of Project Server (from 2002 onwards) directly Notes – this scenario removes the requirement to use Domino. Plainly, as can be seen from the IT requirements, Allocatus immediately provides a huge amount of flexibility in terms of the infrastructure that it can be deployed against. Enough of the theory, let’s have a look at this in practise – the first place to start is by reviewing the video below. Now that you’ve seen the video, the blog will take a look at how this works using Project Server 2013; in the scenario I’m using below, I’m not using either Exchange or Domino to connect Allocatus to Project Server, rather I’m using the Allocatus client installed on my PC to perform the synchronisation; in this way the Allocatus client acts as a synchronisation engine between Project Server and my Outlook client. In Microsoft Project, assign your enterprise resources in the usual way, in this case I’ve used the Team Planner view (if you’ve not used this view, it’s great for planning individual unlinked assignments and ensuring the team is fully allocated). 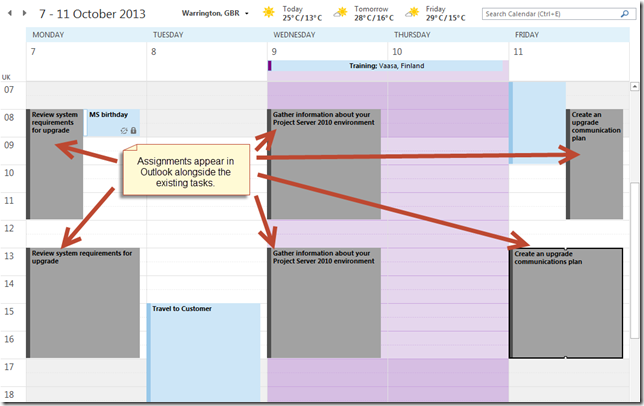 though of course I could have used the Gantt Chart…. Once I’ve finished assigning the resources, I publish the project. I receive the usual Project Server email, plus I can receive an Allocatus email notification, however, I really want to concentrate on the synchronisation with Outlook. Prior to publishing the project, my calendar for the beginning of October looks like this. You can see I have some training booked on the 9th and 10th October, and I’m travelling the day before hand and I’m due back early on the Friday. Now, once Allocatus has synchronised (and by default this is scheduled every 3 minutes if you are just using the client) the tasks assigned to me in Microsoft Project are displayed in Outlook. Note that Allocatus utilises the category feature of Outlook, and so I am able to change the Allocatus task colours which allows me to see at a glance which tasks are Project related. Tasks can be opened within Outlook to view detailed information (by default the Project name and resources are included) and a URL is provided to take the user directly to PWA. This form can be further customised to include Enterprise Custom Fields and task Notes as necessary. Allocatus is written to integrate seamlessly into the Project Server environment, and so the Project Manager will be notified about the changes I’ve made using the Approvals function, and has the choice to either accept or reject these as part of the Project Management lifecycle. There are many other features, including the ability to change the scheduling of the tasks directly from Outlook (this is called Write-Back) and the look and feel of different areas of the user notifications and Outlook forms. I’ll post regular articles on Allocatus, but in the meantime, please see www.allocatus.com or using the contact details on this site for more information!